We complete your order within 24 hours. For large orders (over 500 images) we will quote you a turnaround time based upon the level of difficulty and number of images. Do I have to pay first before I upload the images? Yes. We require payment first because this secures the designer for your images and makes sure your images will be completed within 24 hours. How Do I Download the job once it is completed? We will e-mail you a link where the images can be downloaded directly to your computer. Can I share my images via Dropbox? Yes. Also we accept images via Google drive, Wetransfer and Box. What format will my image be in? If not specified otherwise, you will receive the artwork either in JPG or PNG. We can also provide tiff or gif file as well. If there is another format that is required, please let us know when you place the order. Edited images and original files are saved on our server for no more than 14 days. How do I receive my completed images? Once your order is completed, you will receive a notification in email with a link to download your files. 1. Click “Upload images” button as shown below. 2. Click the button “Select Images” and locate the images in your computer. 3. Enter any details we should know about the order. 4. 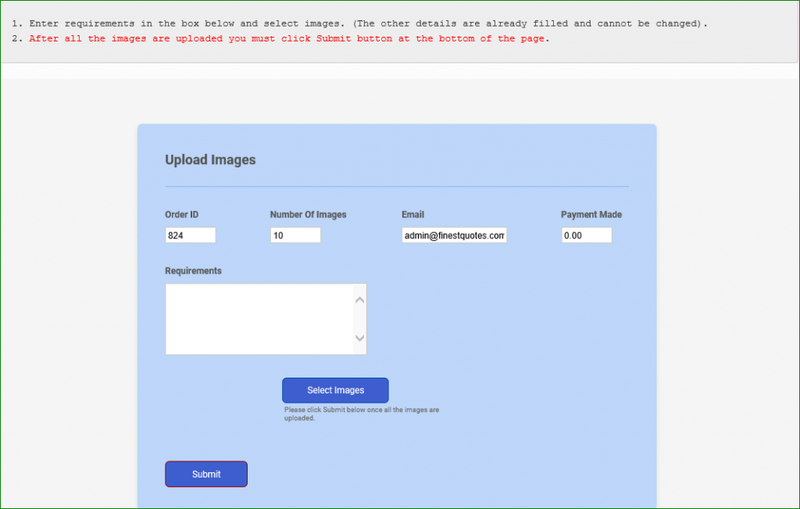 Make sure all the images are uploaded. 4. And Click “Submit” at the very bottom of the page. Did we miss your question? Contact us we would love to answer it!